For many businesses, showcasing digital publications on their own website is a great business solution. Clients can enjoy the convenient presentation and interactive features of catalogs, magazines and more all while browsing the brand’s site. To help you take advantage of this powerful tool, we’ve created a complete guide to embedding your publications! In part two of this series, we will explain how to customize your publication’s appearance in your website. Like many other industries, the business of buying and selling homes has undergone a digital transformation. To help more people find the right home, real estate listings are available often online. And to help exceptional properties stand out, real estate agents are turning to the luxe look of digital publishing. Today we’ll highlight a few of our favorite international real estate publications on Calaméo and explain what publishers can learn from online communications about this one-of-a-kind product. 4 Easy Steps to Boost Your Click-Through Rate! The ability to include external links is a key feature of digital publishing and for many publishers, increasing the number of readers who click on their links is an important goal. Links clicked in an online catalog, for example, may contribute to higher sales in an online store. Click-through rate (CTR) is a common way to measure how many clicks a link has received and shows which percent of all viewers clicked that link. In this article, we will reveal four quick steps that you can take to improve CTR for your digital publications. Filesharing tools are an important part of modern digital life. Services like Dropbox store files on the cloud and synchronize them on different devices so that users can share and collaborate. However, they are not always the best option for distributing your documents online. In this article, we will explain five ways that filesharing services can fall short and why digital publishing can offer a great alternative. A New Way to Include Videos in Your Publications is Here! When you’ve worked hard on creating a great publication, having more choices is always a good thing. 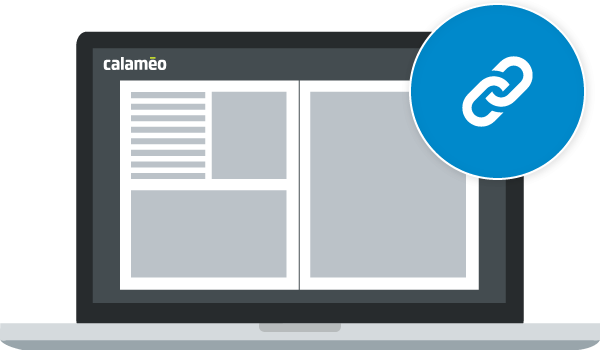 That’s why we’re so pleased to announce that there is now a new option for including video in your digital publications on Calaméo!